I love ricotta. It’s such a versatile cheese. From dessert to snacks to main courses, there are few things that don’t benefit from a little added creamy cheesiness. One of my all time favourite sauces is to stir ricotta with a little chopped parsley through hot pasta. This dish is more of a one bowl meal with the peas and mint adding the green factor. The method on this is a bit fiddly because I wanted to crush the peas, but if you’d prefer to keep it simple just pop the peas in with the pasta together and skip the crushing step. 1. Bring a medium saucepan of salted water to the boil. Add pasta and set timer for the cooking time stated on the packet. 2. When there are 3 minutes to go, add peas. 3. When the timer is up, reserve some cooking water in a cup. Drain. 4. Return the pan to the heat and add 2 tablespoons olive oil. Add pasta, peas and mint. 5. Stir in ricotta, adding a little of the cooking water if it seems too dry. 6. Taste, season and serve with parmesan. vegan – replace ricotta and parmesan with a generous drizzle of extra virgin olive oil and a squeeze of lemon. You might want to double the peas to make it more substantial. carnivore – pan fry some bacon or chorizo and toss in at the end. gluten-free – replace drained pasta with cooked or canned beans or lentils. paleo – replace pasta with roast cauliflower. 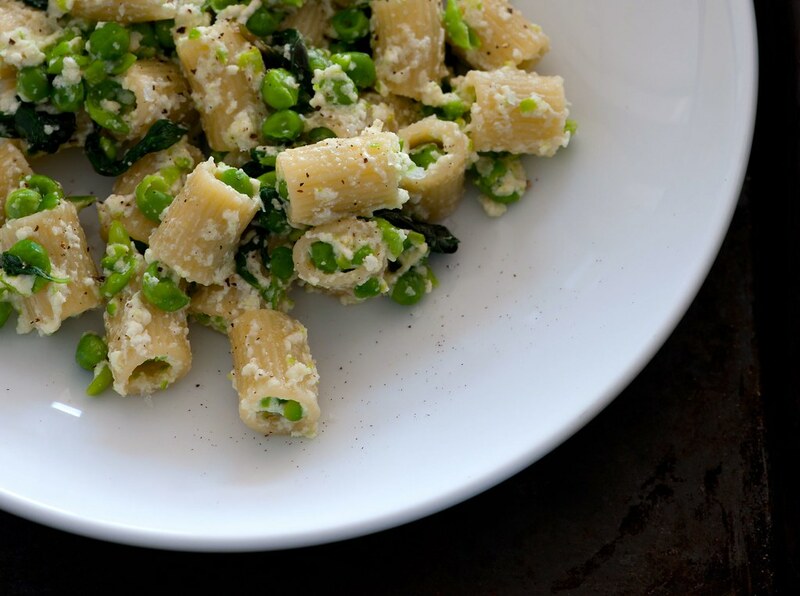 Replace ricotta and parmsean with olive oil and extra peas. vary herbs – peas and mint are a classic combo but basil would make a wonderful change. loose the pasta – chop up 1/2 head cauliflower into florettes and use in place of the pasta or replace pasta with a can of drained cannellini or butter beans. change the veg – toss through ripe halved cherry tomatoes or wilted baby spinach instead of the peas. increase the cheese – serve with freshly grated parmesan cheese. carb lovers / more substantial – serve with garlic bread or add extra pasta. low carb – serve peas and ricotta with pan fried chicken or fish. too dry? – drizzle with a little extra virgin olive oil. peas or pasta over/undercooked – it can be tricky to get the timing right. If you’re nervous about that boil 2 separate pots and cook the pasta and peas separately. If in doubt, make sure the pasta is cooked, the peas will be fine if they’re a little over cooked but undercooked pasta is no fun for anyone. short pasta – keep in the pantry. frozen peas – keep in the freezer. mint – best to use for another meal. leaves can be frozen but will wilt when defrosted so not ideal. Alternatively make a mint oil by packing washed and dried leaves in a clean dry glass jar and covering with extra virgin olive oil use mint oil to serve with lamb, chicken or fish. ricotta – unopened ricotta in a tub usually has a shelf life of a few weeks. Can be frozen. parmesan – will keep in a plastic bag or airtight container in the fridge for months. Can be frozen. Serve warm as a meal on it’s own. Pair it with a classic green salad.